ECCLESIASTIC COMMONWEALTH COMMUNITY - Are You a PERSON? The falacy the evil ones use called BEAT DEAD DAD, is just that. It is an excuse they spew out through their affeminate controlled cronies at-tempting to justify the cog in the wheel they continue to push on their dis-order. In fact, sons and daughters best "support" is having the father with them, teaching them and nurturing them with good teachings. That is what is important. If the wo-man understands that, no thing or no "rules" would be able to divide that truth, knowledge, and the family. The "DEAD COGS" slow and even stop that process (their towering intellect imagines). I tell you though, there are always men and yes, wo-men which are wayward, but as for the affeminate LABEL(personam) demonizing man... it is the evil ones course of action and affect, for that STINKING WHORE RIDING ON THAT ROOTEN BEAST hates the Father, Son and the Holy Spirit. The evil ones know that the wanna-be-man complex exists and therefore also uses their "labels" to tempt the wanna-be-man feel manly by coming to the rescue of that "damsel in distress" which in fact has fallen into the snared trap of the beast. Sort of the false perception of men during childhood believing they are BAT-MAN or POP-EYE, or similar "personas." What you fail to understand is that this man knows exactly where his children are, including the phone number in which to call. All of your pandering conclusions amount to nothing against the fact that this man has not sent one dime of support concerning his children and does not call them..... FOR ALMOST ONE YEAR NOW. Who is stopping this man from doing either? He likes to go on and on about "free will". Well there you have it. You can squabble about driver's licenses and not having address numbers on your house but you swallow the camel on this important matter. "pandering conclusions" "say about your little cheerleading fits"
"swallow the camel on this important matter"
The WHORE WHICH RIDES ON THE BEAST lures and gives many excuses. The trapped DRIVE their KIDS to 501 c3 CHURCHES, GOVERNMENT SCHOOLS, CORPORATE SHOPPING MALLS, CORPORATE DAY CARES, CORPORATE COUNSELORS, CORPORATE PARKS, CORPORATE CIRCUSES, etc... Yet, they mostly give excuses why they do not travel with their sons or daughters to their CORPORATE EXCOMMUNICATED Father. I am looking for the MV Spoken Word Hotline Server, to look at some seminars they have, but I can't seem to find the server through Hotline. Can anyone help me here. I remember studying "person" with someone and we looked through primarily Biblical renderings of the etymology. It basically came to a facade. An appearance or mask for the man or woman to wear (in commerce). The person is mostly represented by legal name as it is from social compact that a person can come into existence. The person is thus treated within the contract like any other corporate creation. The suppositional wagering scheme capitalizing on the presumed death of the man or woman, and the collection of a life annuity within METRO, creates of course the nom de guerre (Strawman), the legal name in all upper case letters. and they all tell us how to paint our face. it's the one that never leaves a trace. Fleetwood Mac, Peacekeeper - Say You Will album. P.S. Entering the district courts of the United States in the true name is gibberish (no standing in judicio) because it becomes a class action suit for all men and women - cancelling the national debt upon recognition. This is because there are no special needs (title - the man is coming before the bench as a "father" or "Painting Contractor" or "Medical Doctor" etc.) to adjudicate. A simple man or woman, as opposed to a person, has the same title as any other man or woman. A good book about this is Legal Identity; The Coming of Age of Public Law by Joseph Vining. Bill can find it; (719) 578-5044. MS Word 2000 synonyms for the word �identity�: individuality, uniqueness, distinctiveness, characteristics, self, character, and personality. Could someone steal your individuality? Your uniqueness? Your distinctiveness? Your characteristics? Your self? Your character? Of course not! Someone might pretend to be you, but would your mother know that it was not you? We venture to say that if someone can steal your �identity�, then your identity is not you, it is separate of you, unless of course, one�s res, the substance, the body temple, is kidnapped; and just because they kidnapped you, they do not become you. Even if they could put their life�s essence in your body temple, they still are not you! Res. �By �res,�according to the modern civilians, is meant everything that may form an object of rights, in opposition to �persona,� which is regarded as a subject of rights. What they have truly stolen is your persona, your guise [costume/disguise], role [part], or fa�ade [pretense]. They have stolen your �person�, which Noah Webster, c. 1828, defines as �a Latin word signifying primarily a mask used by actors on the stage�. What is it they have stolen then? They have stolen that which identifies your person, your persona, they have stolen your graven image, your similitude sometimes referred to as an ID. It would seem that they mean one of two things, either a civilian is a �private citizen� or �one who is skilled or versed in the civil law�; we will presume they mean the latter, though this may not be the case. Either way, here is the important point made, there are two of you! One is the object of rights; the other is the subject of rights. �while the subjects are bound to obey the laws. We see from this that the objects are sovereigns while the subjects are not; the subjects are subservient [submissive, obedient], they are slaves. We also see from Black�s Law Dictionary definition of res, that the subject, the subservient slave, is the persona, the person, which of course is not you, the living, breathing entity [object]. Did Yahweh create this persona? No, the STATE created this persona so they would have subjects. The object, the living, breathing entity, owes his or her existence to Yahweh, and as such, owes his Allegiance to his Creator. We ought to obey Yahweh rather than men. This is why both Yahweh and Yahushua say that they, and we, should not be respecters [have regard for] the persons of men, the masks without the breath of life, created by [of], and thus belonging to [of], men, and are hence, of the world. They are not of the world, even as I am not of the world. Is Yahushua here saying that they are not in the world? Absolutely not!! He is saying that their origin, as living breathing creatures, is not of the world, hence they are not the chattel property of the world. People who read this to mean that they are of another �place� do so at their own peril. My people are destroyed for a lack of knowledge� In fact, a mere two verses later, watch what the Wonderful Counsellor says: As thou hast sent me into the world, even so have I also sent them into the world. So what should one do if his �identity�, his persona is stolen? We answer, �walk away from it, let �em have it�! It is cause for celebration, according to brother Kevin!! He says, "throw a party"! The Good Tidings [Gospel] of Thomas, verse 11 states: Yahushua said, ��On the day when you were one you became two. What day is that for most of us? It is our nativity day [living breathing being], which becomes our birthday [corporation] at the signing, usually by the mother, of the birth certificate, the certificate of lading, though it is not binding until novation [novatio in Rome] has taken place, so don�t be to quick to blame your mother. That was done, without her understanding, only so you would get used to the monkey on your back. It is novation that takes one from the original contract [Covenant] and places him or her under a new contract [covenant]. Care to guess what the new debt or obligation is? Care to guess if this is between the same or different parties? The really neat thing is this; this is purely voluntary. It occurs when you are of age, the age when you or your guardians [parents] state that you are ready to enter into binding contracts. It is accomplished by your getting and using, or simply using, if your guardians procured a chattel number for you at nativity, a social security number. Some people claim this was done without full disclosure. Is this truth? Perhaps not. How can one claim that this was not disclosed when it is written in the Owners Manual? * Thou shalt make no covenant with them, nor with their rulers [gods]� for if thou serve their rulers [gods], it will surely be a snare unto thee. Is this not �full disclosure�? Is it the Owner�s fault if we didn�t read the Manual? We think not, there was certainly enough of them left lying around, in virtually every nook and cranny of the earth!! Is there a way out of this snare? Yes, "The Law always provides a remedy" [a Maxim of Law]; it�s all in the Owner's Manual. This is fulfillment of the Abrahamic Covenant through the Messiah of God. I mentioned a good book "Legal Identity" and it confirms your well-thought research. And for a little amplification on "voluntary compliance" I believe I have found that cusp in modern history. Recognized Government bonds [against Birth Certificate novations] are as safe as Government currency. They have the same credit back of them. And, therefore, if we can persuade people all through the country, when their salary checks come in, to deposit them in the new accounts [suppositional wagering scheme capitalizing upon the Life Annuity against the Strawman/NOM DE GUERRE before the man or woman actually dies], which will be held in trust [the public trust of Article VI Constitution] and kept in one of the new forms I have mentioned, we shall have made progress. [emphasis and commentary in brackets mine] Public Papers and Addresses of Franklin D. Roosevelt, Random House 1938 p. 18 - Address before the Governors' Conference at the White House. March 6, 1933. You have hit the nail on the head, as the saying goes. We are working on a reply to the quote you gave from the book "Legal Identity", which unfortunately we have not yet read. It may be that you could not have chosen a better quote from that book! There used to be a website called SovereignKing and their motto was "Information = Freedom"...not exactly, but close, Knowledge = Freedom is closer, but then only if one understands and can use that Knowledge does it become Wisdom. This author gives us three examples, (1) a postulant was �born again� when he became a monk, (2) a squire was �born again� when he entered knighthood, and (3) a woman was �born again� when she married. HEAD, n. hed ...3. A chief; a principal person; a leader; a commander; one who has the first rank or place, and to whom others are subordinate. The underlined portion of the above definition is exemplified by this verse of the Scripture: We ought to obey Yahweh rather than men. The fact that they now have new names, or titles, may only serve to signify their new status [state]. This may also be why we see so many name changes or new surnames in the New Covenant [Testament]. *Emmanuel [Immanu�el which translates, the Ruler is with Us] himself, was probably renamed Yahu�shua, which most claim means Yahweh is Salvation, but appears to mean, Call upon [the Name of] Yahweh (see H7769 in Strong�s). In the Old Covenant [Testament] we see Abram and Sarai (Saray which apparently translates Princess) renamed Abraham (Chief of Multitude) and Sarah (Noblewoman), and Jacob [Yahu�aqob translates Yahweh�s Heel Catcher] is renamed Yisra�el after overcoming. We also see Shalom�oh [Solomon] renamed Yediydeyah [beloved of Yahweh] by Nathan, etc. etc. Not to mention all the name changes made by the scribes since the original writings, which in our humble opinion, serves to hide information from the readers since we perceive there is knowledge hidden within the original names. We also read that those who overcome will be given a new name (Rev. 2:17) and that all things will be made new, 2Corinthians 5:17 Therefore if any be in the Anointed One [or Anointing], [he or she is] a new creation: original things are passed away; behold all things are become new. These �original things [that] are passed away� would obviously include names since Shaul, the Little goes on to say �all things are become new�. The importance of names is verified, in our humble opinion, simply by the fact that variations of the word name appears approximately 1,005 times in the Scripture (KJV). And finally we read at Yasha�yahu (Salvation [is of] Yahweh) 44:5; One shall say, I am Yahweh�s; and another shall call himself by the name of Jacob(Yahu�aqob); and another shall subscribe with his hand unto Yahweh, and surname himself by the name of Israel (Yisra�el). Yisra�el is basically just another way of saying that all of Yahweh�s citizens are suverans [correct orthography of sovereigns]. Keep in mind that this definition is not referring to �physical death�; dying to the world is a �civil death�, which in Law is equivalent (equal to) to physical death, in that the �person� dies, but not the breathing man/woman who bore [carried] it. We are �translated�, we are conveyed from one condition to another, the same way a postulant becomes a monk, a squire becomes a knight, or a woman becomes a wife; it is a change of status (condition), and new names or titles are perhaps but signposts to the world, notification of this change. But that is not true. The name for Jesus was Yehoshuah according to Strong's #H3091 and clearly from #H3068 and #H3467. "Comp. 1954, 3442." The prefix "Yehu" like Yehudah (Judah) is in no way theophoric and has been "Talmudized" as a slur against Jesus being the Messiah of God. I am going to leave it at 'thank you' for citing Strong's for authority. So did I. You have established your trust in Strong's Exhaustive Concordance by your own testimony. So you see for yourself the spin you weave. From H410 and H7769; God of supplication (or of riches); Elishua, a son of King David: - Elishua. From H4428 and H7769; king of wealth; Malkishua, an Israelite: - Malchishua. Are we to understand that if one finds a �pearl� in a book, one must then adhere to every notation written in that book? If that is the case then there is no book available as a resource in our humble opinion. Proverb 25:2 It is the glory of Yahweh to conceal a thing: but the honour of kings is to search out a matter. Again, we thank you for your kind response. P.S. Dr Strong also screwed up the name Joseph and many other words and names, but this does not make all his works wrong, just as you and I may screw up here and there, but it also does not make all our works wrong. I perhaps come off unkind but I am being acutely frank. What is wrong with the picture above as you state it is that the "u" "oo" sound is in the suffix, not the prefix. But you put the "oo" sound in the prefix; the difference between what is correct according to Hebrew conventions and Dr. Strong "Yehoshua" and the way you spell it - "Yehushua". There is a definite long "o" sound in the prefix because the name "God is (my) salvation" is definitely theophoric. The "u" "oo" sound is consistently in the suffix of Hebrew theophoric names. Never in the prefix as the entry from Encyclopedia Judaica clarifies. I am idealistic about this because when one is off on this basic doctrine, I find faults follow in about any other doctrine. Either way it is "Yeho" in the prefix from Yehovah. So I see the arguments you make sophistry. Also I presume you wish to convince me for the same reasons two or three people have attempted to convince me are valid in my past experience. And those reasons made no logical sense anyway so I cannot recite them. Sometimes I might better just drop the subject. But I did not so I apologize if it was incorrect to point out the mistakes you made in your Reply. Speaking of being a sophister, in your reply you strained at the gnat while swallowing the camel, in our humble opinion; that is to say, you make a major point out of our spelling of Yehovah, Yahve, Yahwe, Yahveh, Yahweh, Yahuweh, Yahuwah, IAUE or as the Oxford English Dictionary, as well as the French Grande Encyclopedie prefer, IeHUeH, while virtually overlooking the shua [#H7769] and yasha [#H3467] endings, which of course was the main gist of that whole exercise, demonstrating that of the three names ending with shua, the most significant Name was inexplicably given a different suffix number than the other two, by Dr Strong. And we know that it was probably just a typographical error but we never spell the Messiah�s name Yehushua, since after years of study ourselves we have come to the conclusion, at this time, that the correct transliteration of the name is Yahushu�a [pronounced yah-oo-shu�-ah], and the Founder of the Nation�s name should, as far as we have been able to ascertain thus far, be technically transliterated Yahuwah or Yahuweh [the four semi-vowels making up this Name, make three syllables: (1)yah-(2)oo-(3)ah� or yah-oo-ay�, not two as in yah-way, for example]. As you no doubt know all names connected with the Creator�s name, yodh, hey, waw, hey [all semi-vowels, as well as the aleph] were significantly tampered with by the �Iews� during and after the Babylonian captivity and, according to the Talmud, every effort should be made to hide the Name above all names, these included such things as: syncopation (See endnote), vowel pointings were added, which turns the semi-vowels into consonants, then the vowel pointings were changed again because even the short form of the name that was found at the beginning and ends of other names, etc. was later deemed to be unacceptable to be uttered as well, and on and on it went [and presumeably goes]. And knowing their feelings concerning the One Anointed King/High Priest one can just imagine what they might do with his name. The only thing we can be relatively sure of, his name was never JESUS! The Iews didn�t allow their people to even associate with the �Greeks� [non-Iews], let alone name their children after them! And to accuse us of using sophistry is not acute, it is downright rude, which we hope we have never been to you, David Merrill. Your perceptions that all the experts have been tampered with defies all logic to me. You are the one who feels your (unsubstantiated) research is 'superior'. No, you have not been rude. I consider you very studied and literate. But I must add that I find your references to "we" when I think you mean yourself, unbalanced. Now clearly you are admitting the "oo" sound is in the suffix. Then you spell the name with the "oo" sound in the prefix. I have not understood the deviation to the "Yehu" prefix. I know there are a few folks who adhere to it adamantly. But I will not follow it on such scanty evidence. You have systematically altered many names to fit your "Yehu" prefix agenda. I suppose a subtle attempt to sound convincing to people who do not have or do not want to look in Strong's to verify what you say is true. I suppose you will say Dr. Strong is incorrect on the basic doctrine and therefore his mistakes, like the other standards are completely wrong on this whole 'prefix'/'suffix'/"O" v. "OO" sound thing. But the accusation of sophistry addresses the rudeness of so subtly interjecting false doctrine on a widely read Topic thread. There must be a motive behind altering the truth. Dear David, we don't mean to be rude, but do you have trouble focusing, since you STILL have not tuned into the fact that the topic of concern was THE SUFFIX of the name YehoSHUA [#H7769 - a halloo] vs. YehoYASHA[#H3467 - to be open, wide or free, that is, (by implication) to be safe; causatively to free or succor] and NOT the PREFIX. We have no problem with you or anyone else using Yeho- if they so desire, or if we use Yahu- either way the intent is the same: to use the Founder's Name! And you seemed confused that if something takes on new characteristics [status] it is only logical that it take on a new name, not a NICKNAME. NICKNAME, n. [G. To banter. Signifies to surname, to call by a name of reproach.] A name given in contempt, derision or reproach; an opprobrious appellation. And we perceive that perhaps we are not the first that you have accused of being imbalanced, so we take that accusation with a grain of salt. Thank you for explaining there is more than one at your keyboard. I apologize for implying mental health problems in your use of "we". Because I have found the people I have met who use "Yehu" instead of "Yeho" off in most doctrine, I had to bring it up. You had made some very coherent points about PERSON and identity. Then I saw you changing names in your last treatise above. So it is suffice to say that I do not feel the same way. Your insistence about the doctrine, and now your attempt to mitigate its importance make me wary about the other things you have to say. The primary 'minister' who fell into this doctrine would try to explain it has something to do with Messiah ben David being Yehudah (tribe of Judah). But even that does not justify mutation. You have tried to explain that the Jews have messed us all up. That kind of stuff makes no sense for some obvious reasons. One. The Jews messed themselves up as well except for what could be preserved in synagogue esoterics like Freemasonry etc. Two. There is no motivation to pervert the truth about the Hebrew language, Biblical or modern. I really do not feel I am overreacting. You changed the prefixes in your examples even though you were making the point about suffixes. But I apologize anyway because I have argued this point several times here on ecclesia.org. I think it is non-productive except to understand better identity crises and relationships for PERSON in commerce. We, Robert: and Kathleen:, gladly accept your apology and we too apologize to you and totally agree that it disrupts the flow of information to get into these more personal aspects. You should be suspect, in our humble opinion, not only of our, but of everyone's motives, for it it is written that false brethren will be brought in unwares to spy out our freedom. All we can do is to assure you and all the brothers and sisters who read this that we have no desire to disseminate false information, though at times we may be wrong in our conclusions. We will correct our course immediately upon discovering these errors and do our best to notify anyone who may have gotten any bad information from us. And finally, the instructions to "disguise" the Name, can be found in the Tamid vii 2 (=Sota vii. 6). C.J. Koster in his book, Come Out of Her My People, and many others too numerable to mention, have come to the same conclusion we have concerning the sound of the first syllable but that hardly makes it "set in stone". For anyone here who is not familiar with the way etymologies are set up they are read from right to left [oldest to most recent] like the Hebrew language, thus that particular one would read "older Canaanite name > god Yahu, ya..."
Either this dictionary is wrong [only one thus far that we have found that says this] or we may have a serious problem. 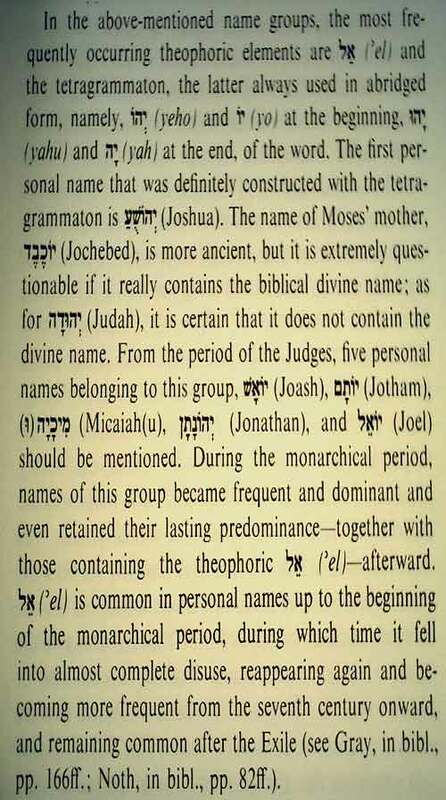 And as for the name Judah, our studies have lead us to believe that the name of the Creator is not at all connected with this name, in fact, it is our humble opinion that it should probably be Yadah [or a variation thereof], and in all probability means, to "throw a stone away". This name most likely came about because Leah found out at his nativity that she had "left child bearing", that is to say she thought she could never have another child, cursed the Creator and without washing the infant, threw him into a field [the field of blood] where he was left to die. Anyway, let us put this minor strife behind us, David, and move on to bigger and better things. It is done. I am really impressed with this particular Topic. The people who I have read are thoughtful and really exhibit a mature intellect about so many different ways to treat the issue. To me, the issue is dichotomy. The creation of a quasi-mathematica entity for capitalizing upon as though dead. Of course the entity is dead anyway but it really represents a life insurance policy, an annuity bonding on the man or woman from the cradle to the grave - a suppositional wagering scheme. Also the death presumption of a Samurai; the fallen leaves doctrine - an invincible warrior already considers himself dead - the nom de guerre (Fr. NAME OF WAR). Now there are a lot of readers out there who are not writing and I can presume they do not want to call up my dad and bother him about this stuff just because they can find him in the phone book. Or my brother or sister or whoever. So I am not going to bother sanitizing my family name because it is so important to see this creation of the person the world so wants me to be. The important thing is to examine this testimony is not mine*. 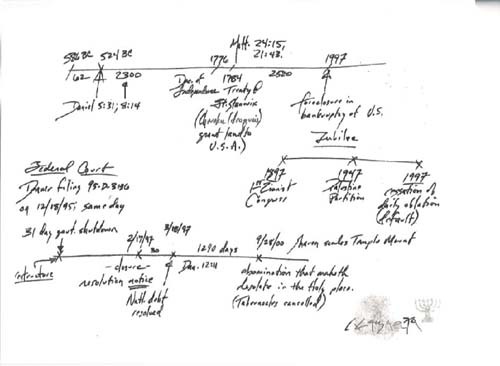 I found testimony of others and you will see the development of a quasi-mathematical entity DAVID MERRILL VAN PELT through my father's "Full Name" (legal name). On the front side of the Birth Certificate we see the true names of Philip Jansen and Louanne, my father and mother. 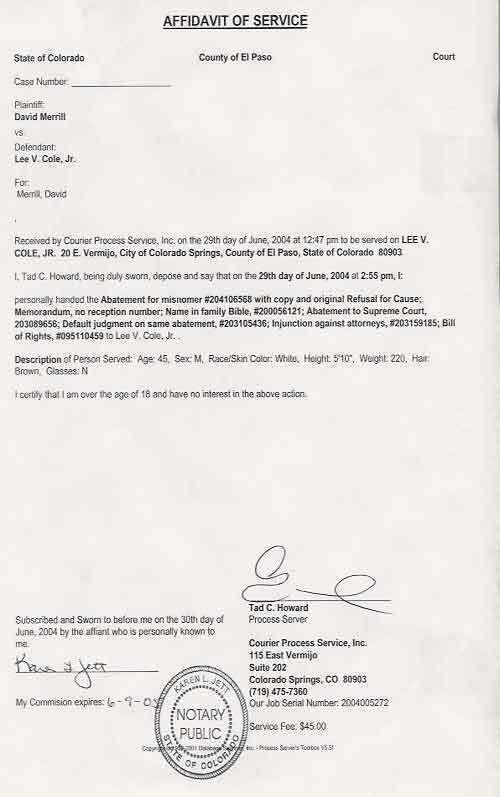 Then see the commercial registration following for the entity supposedly attached to me and my parents are named by "their" legal names and they still call this a "CERTIFIED COPY OF BIRTH RECORD". 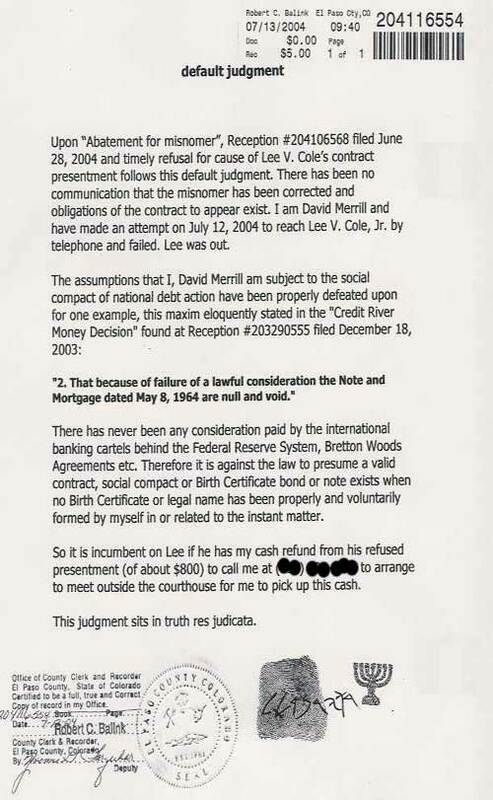 Albeit they have obviously changed my name David Merrill to the legal entity "David Merrill Van Pelt" and then created the artificial entity upon that, "DAVID MERRILL VAN PELT". I have traced origins of this metaphysical manipulation into Medieval times around Hugo Grotius and St. Thomas Aquinas. These endnotes are from (memory serving) The Just War of Grotius and Aquinas and The Metaphysics of St. Thomas Aquinas. * I am over 18 and of sound mind and body. Especially since my testimony agrees with this acquired testimony of people who were there, I am David Merrill. Because I know my identity, I naturally avoid giving testimony that will incriminate me or obligate me for the legal fictions. I can use the fictions as I please if I carefully investigate the contracts and behave honestly - Rule E(8) supports my restricted appearance to speak about only the contract that has been noticed. Therefore my abatements for misnomer hold.